Last Friday, I took advantage of the extra day off work due to Hanguel Day. 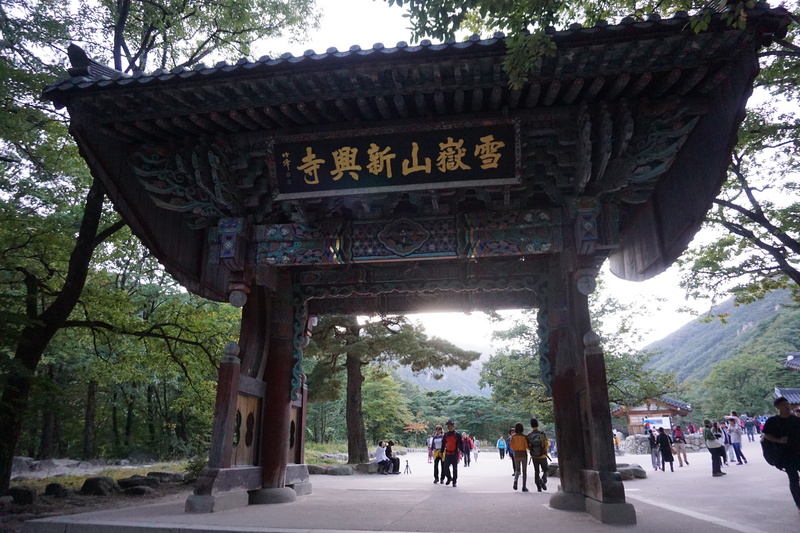 Hanguel Day is a national Korean commemorative holiday marking the invention and proclamation of the Korean alphabet, Hangul. It’s been nice to have these extended long weekends off, but this will be the last of them until Christmas. 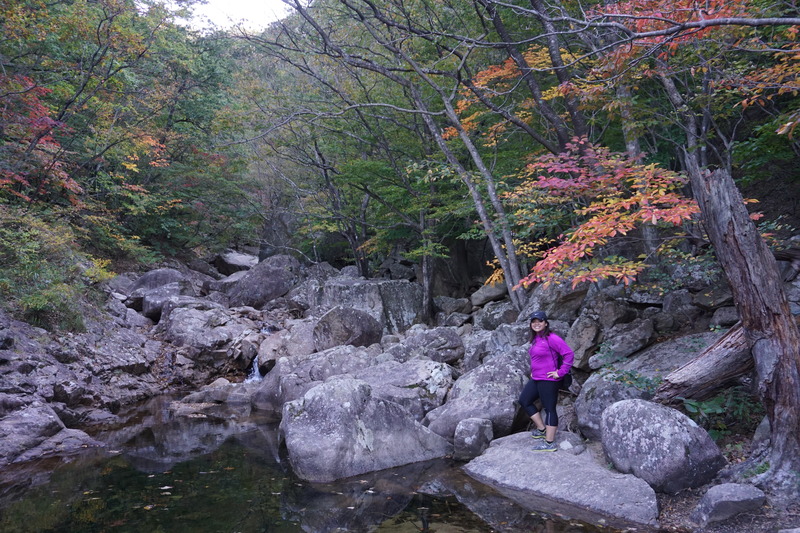 I had been waiting for autumn to hit and the changing of the leaves to visit Seoraksan National Park. With the humid summer behind me and winter not yet here, I honestly don’t think I could have picked a better time to go. 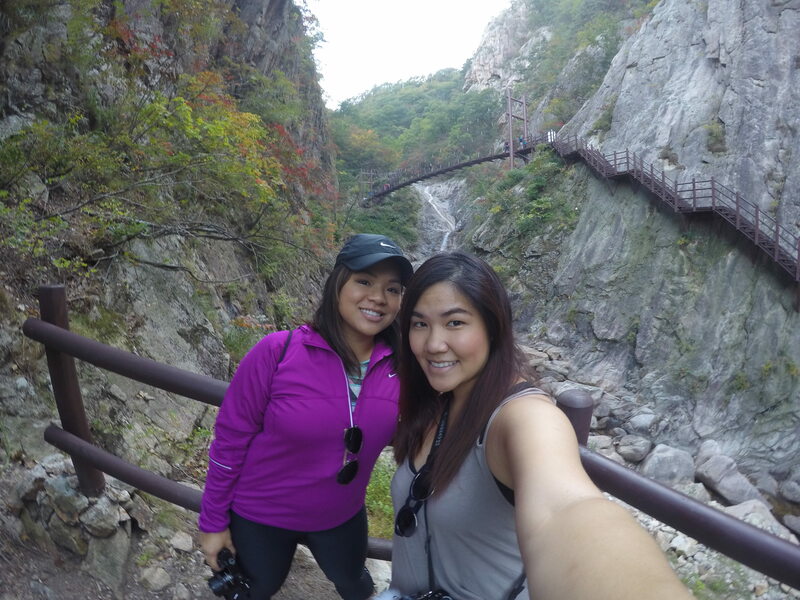 My good friend, Dianna, lives in Sokcho so the leap over to the park was a quick 20-minute bus ride. 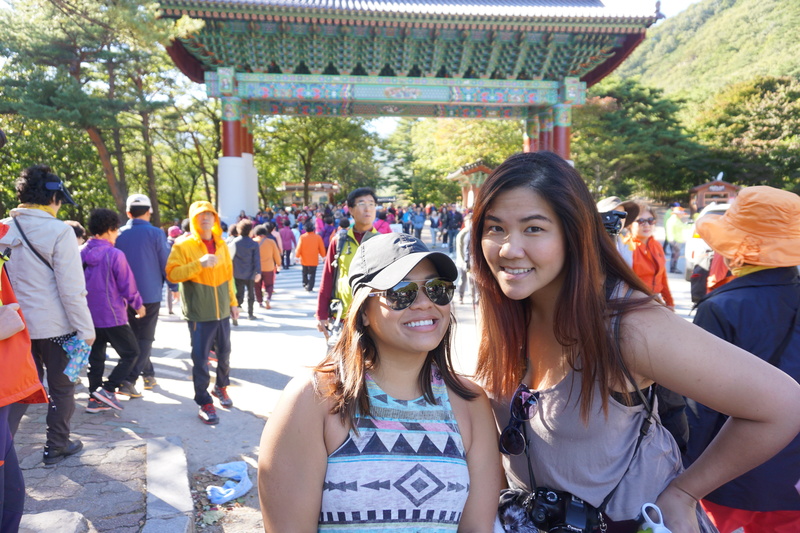 However, the park was packed with Koreans in their full-on hiking gear and bumper-to-bumper traffic. The bus dropped us off about a mile or two from the entrance, because it would’ve taken forever just to budge in the congestion. 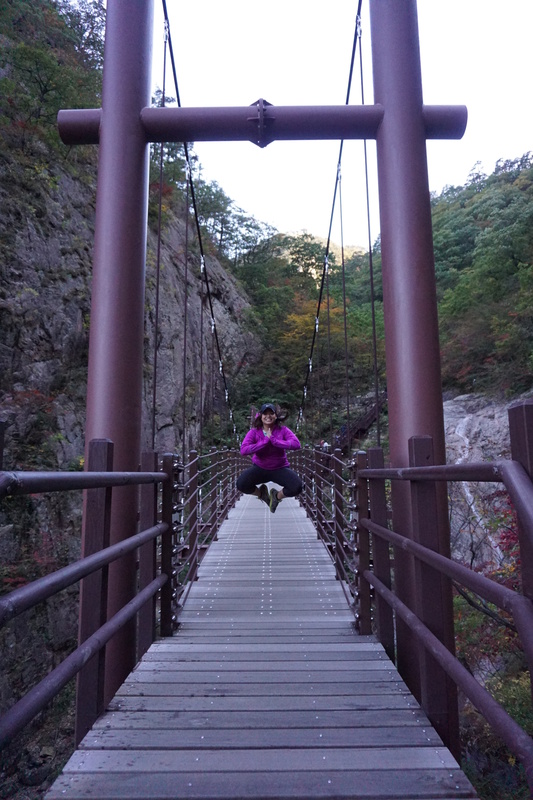 We got to the park in the early afternoon and went for only a short hike to the suspension bridge. Dianna picked up a bottle of corn makgeolli, rice wine, from the local GS 25 convenient store for us to enjoy when we reached the bridge. 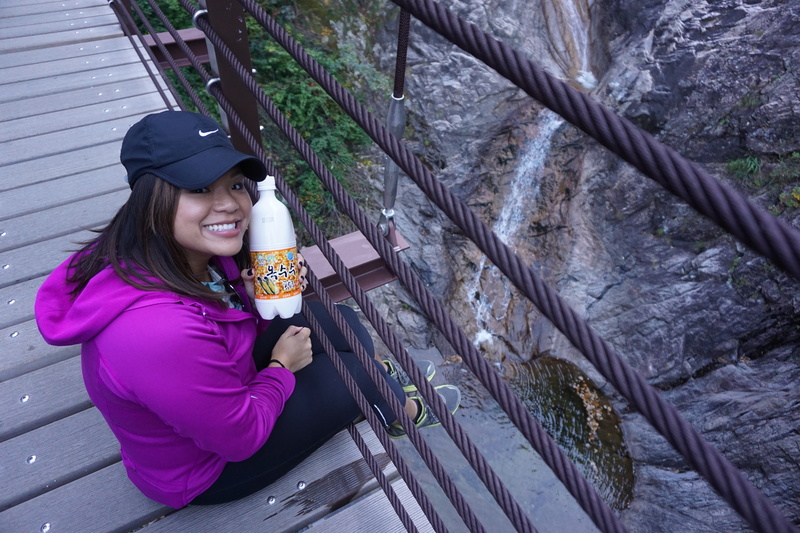 I’ve heard from many people that makgeolli is the refreshment of choice among Koreans during and after a long hike. I did see some vendors in the park selling the stuff for much more than what we bought it for outside the park. 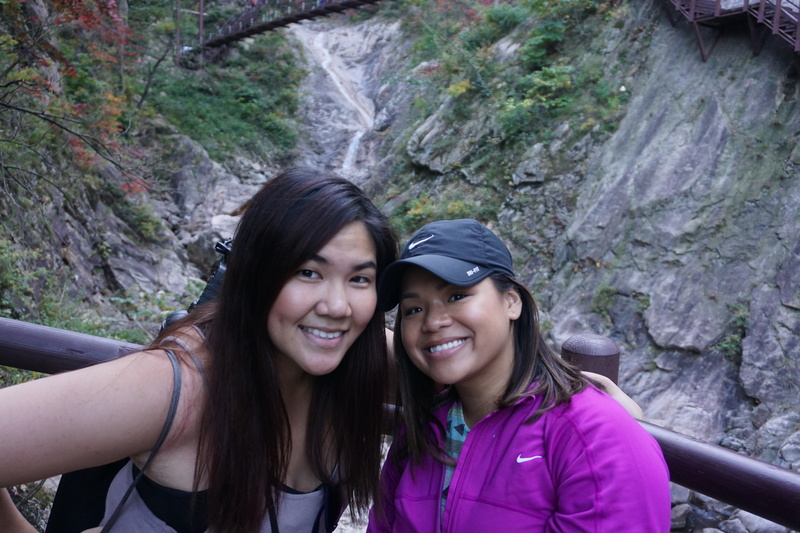 As we sat on the bridge taking swigs of makgeolli, waves of Korean hikers passed looking at us as if we were crazy to hang out atop of a bridge. We did have a few people giving us the thumbs up for bringing the makgeolli. 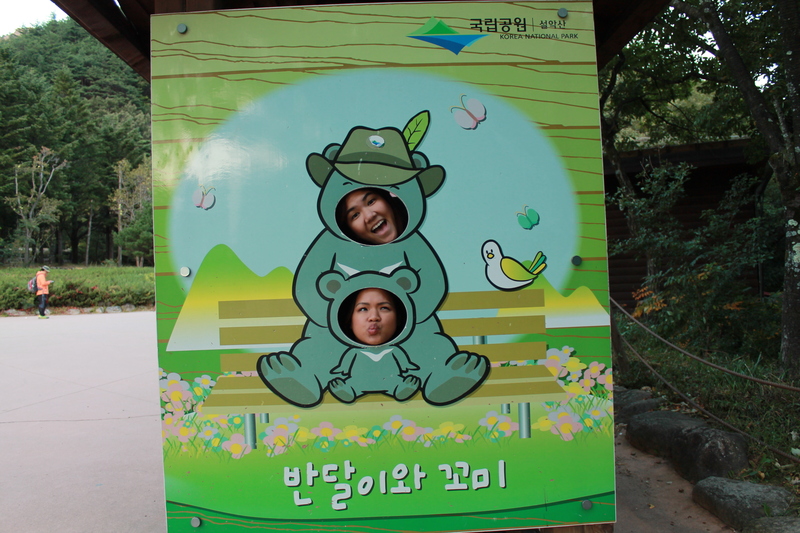 As usual, we’re always drawing attention to ourselves by doing foreigner things in foreign places. Corn makgeolli, honestly…not my favorite. Hanging on to dear life….not really lol. This was surely not a serious hiking day for us. 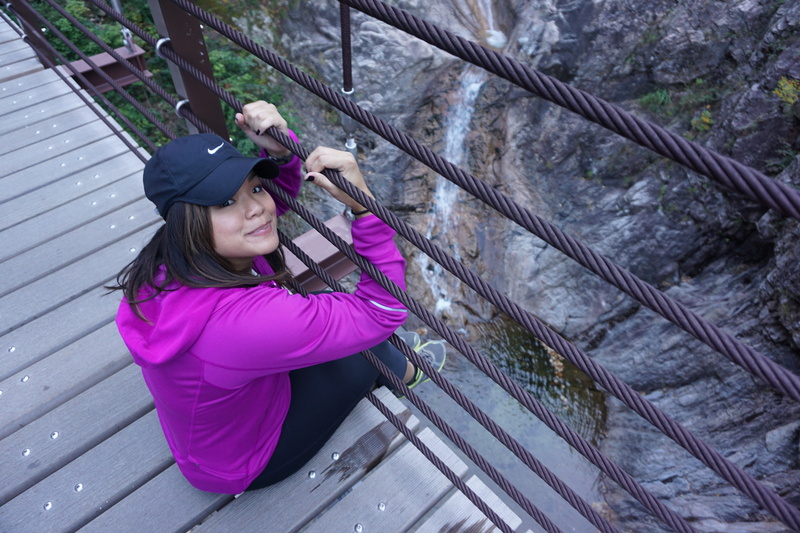 The hike to the suspension bridge and back couldn’t have been more than 5 kilometers. We came to take in the sights, snap some fun photos, and hang out. Suspension bridge in the background. 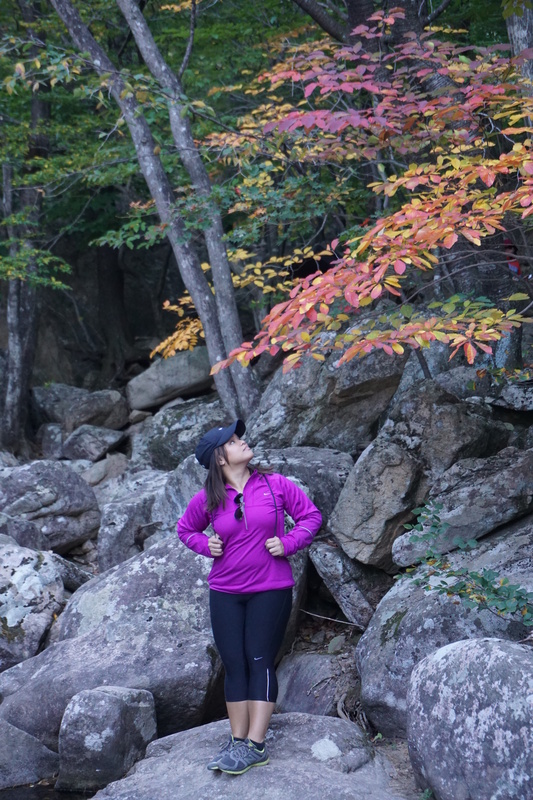 The park is huge with many different routes to take and trails to hike. We missed the cable car by a few minutes as they were closing. 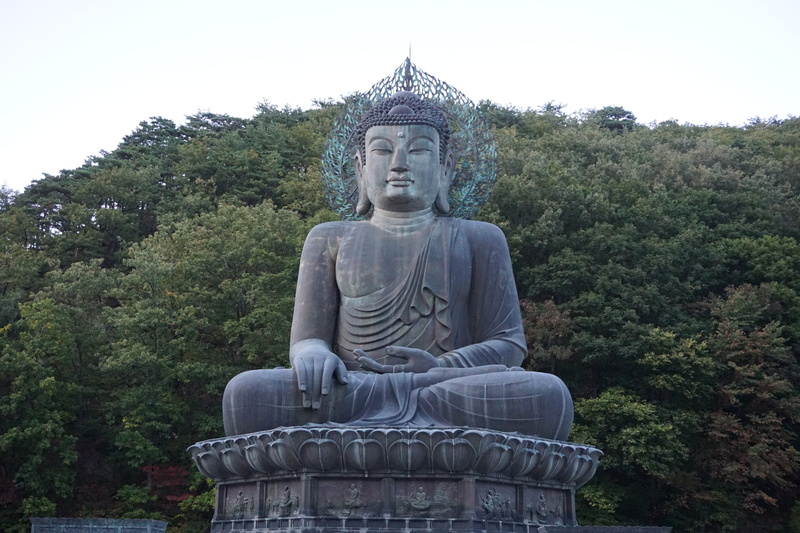 The sun was setting fast but I was happy that I got to see the bridge and the huge Buddha. 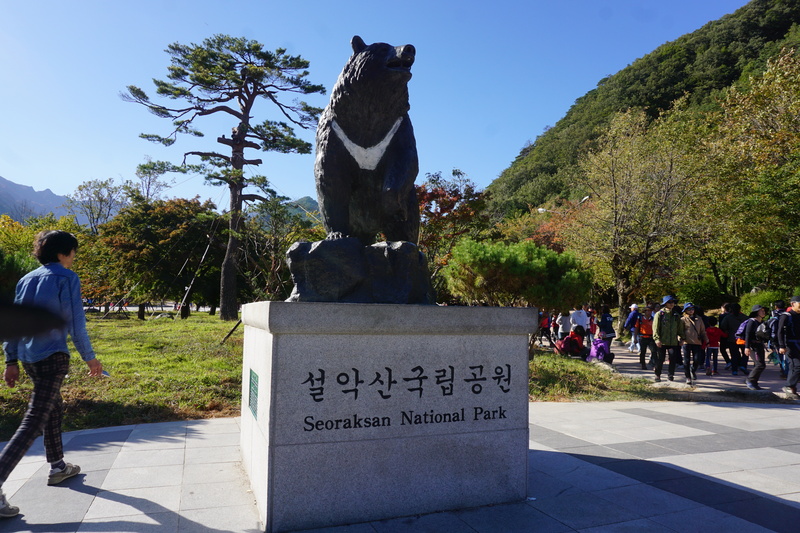 Seoraksan offers many majestic views. I hope to visit again when the seasons change and hang out with this smiley bear! 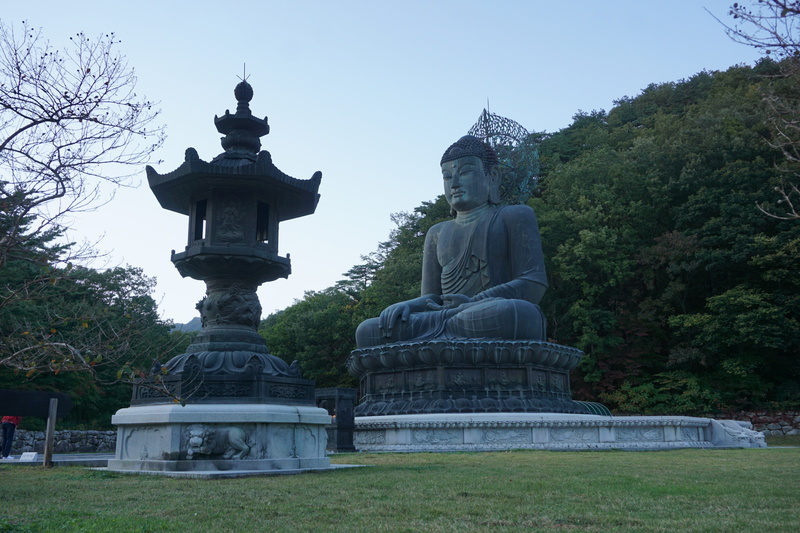 This entry was posted in Korea, TRAVEL, Travels, WATCH and tagged Adventure, Buddha, Gangwon-do, Hiking, Korea, makgeolli, Seoraksan, SeoraksanNationalPark, Sinheungsa Temple (Seoraksan) (신흥사(설악산)), SouthKorea. Bookmark the permalink.